Don't be deceived by its seemingly insignificant status, because the fluffy collar is the small fashion detail making a serious impact this season. Whether it's the Insta-famous Saks Potts leather coats, Stand's colour-pop pieces or Topshop's vinyl iterations, this is a trend that comes in all shapes and sizes. And yet, it's united by its ability to outshine any showstopping dress or spangled pair of shoes. This coat wants all the attention and is not afraid who knows it. After all, when it's freezing outside and all you can see is your coat, you'd better make it a good one. In contrast to the high-tech fashion anoraks and Michelin Man–inspired puffas cropping up on the pavements of fashion week, this sepia-toned trend is reminiscent of the sultry ensembles of old Hollywood femme fatales. In other words, they come with a generous side order of sass. 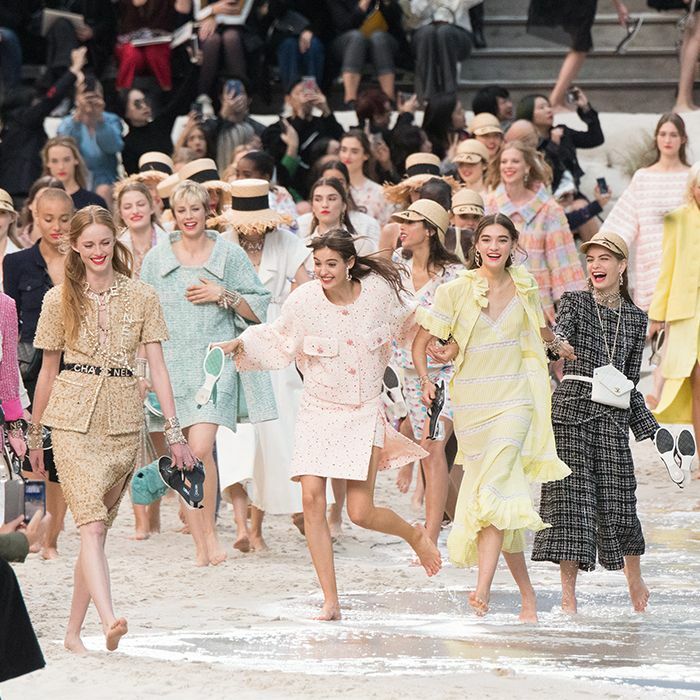 They may have originally been worn with ankle-grazing frocks, ice skates and fur muffs, but in true 2019 style, the fashion crowd has enjoyed subverting the retro undertones and pairing theirs with light-wash denim, chunky jewellery and clashing prints. The beauty of this coat trend is that it's available at every price point—from under £50 to over £500. Not only this, but it's also a style that lends itself to buying secondhand (which is always a big plus in our books). Who What Wear's Hannah Almassi found hers on Etsy, and to be honest, we can't tell the difference between her coat and some of the new designer offerings. Try scanning Vestiaire Collective, Etsy, Rokit or Oxfam to nab yourself a one-of-a-kind, vintage gem. Style Notes: A pop of powder blue kicks this leopard-print coat into catwalk territory. It could only be Shrimps. Style Notes: Nnenna Echem styles Saks Potts's sellout fur-collar coat with a print-clashing pair of trousers and chunky sneakers. The perfect mash-up of styles. Style Notes: Pink faux fur and high-shine patent make for a delectable pairing. Style Notes: Musier Paris dives into the archives with this leopard collar and cuff coat. We love how Lotta has styled hers with bleached straight-leg jeans. Style Notes: Who What Wear's Hannah Almassi was determined to find a secondhand version of the fluffy collar coat trend. Luckily, she struck gold with this gem from Etsy. Style Notes: A little less fluffy, but with no less impact. Stand's shearling collar patent coats are all we want to be wearing this winter. Style Notes: Ever since this baby came into my life, I have barely taken it off. I love to style it with skinny jeans and chunky lace-up boots for an urban twist. Scroll down to see and shop our favourite fluffy collar coat. The purple looks so good against the brown check. A vintage gem you'll love for life. A '90s-inspired winner for your wardrobe. The classic denim jacket never looked so cool. Warm yet so so chic. Yves Saint Laurent for less. This is monster chic at its finest. A more subtle but no less impactful iteration. Yellow checks and orange faux fur will brighten up your winter wardrobe. This will look so good through winter and into spring. Now that's what you call a statement collar. Mix this classic coat up with urban separates. Pink and leopard print are our fave new-season pairing.